Jason started a meditation practice in 1994 and learning physical aspects of yoga in 2005 and slowly developed a personal daily practice. With his regular yoga practice, he found the personal therapeutic benefits to help overcome his personal physical and emotional challenges. 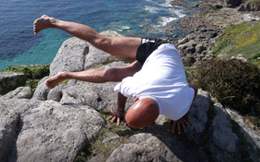 In 2013 Jason set up [skinnibuddha] to provide affordable and accessible yoga and yoga therapy in Plymouth. His classes are PAY WHAT YOU WANT. Since then he has been teaching yoga to help those in the local area to take responsibility for overcoming their own difficulties. He calls it ‘SOUL LEARNING’. While Jason teaches a variety of Yoga styles (Ashtanga, Vinyasa Flow, Rocket Yoga, Traditional Yoga Therapy and Yin Yoga) there is one aspect which unites them all: the breath.